A terrific way to introduce kids to the workings of farms, by letting them perform daily tasks using large farm equipment. Little Farmers opens to reveal two farms: one that raises livestock and the other that cultivates crops. Both offer wannabe-farmers a passel of tractors and other machinery to drive. The driving controls have been simplified so that kids just move their fingers across the screen in the direction they want the truck to go. The app suggests driving tasks, but kids can choose to do their own thing. If they do follow the app's suggested driving task, they earn a sticker when the job is completed. 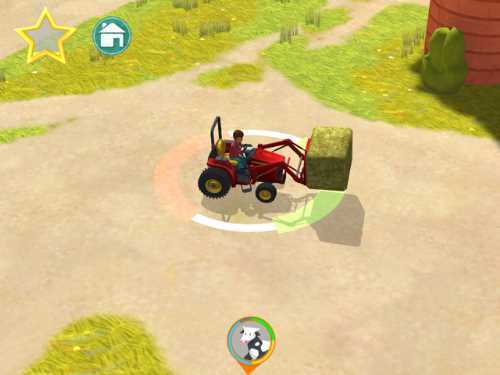 Once a machine has started a farming task, such as harvesting the corn, kids can stop driving and tap on the vehicle to make it finish the task without the player's direction. 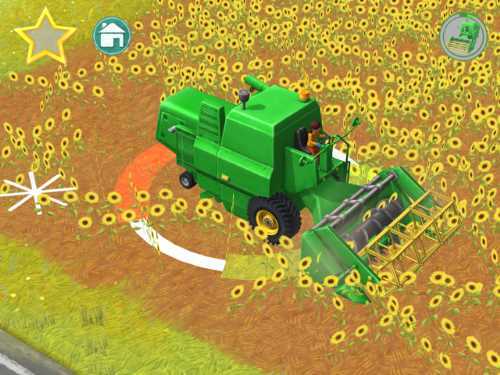 By selecting the crops farm, kids see fields of sunflowers ready to be harvested. They can jump on a harvester to drive over the field and collect the sunflower seeds. Other tractor options include plowing a field and planting a new crop of either corn, wheat, or more sunflowers. With the livestock farm, kids use machinery to deliver feed and water to chickens, cows, and pigs. 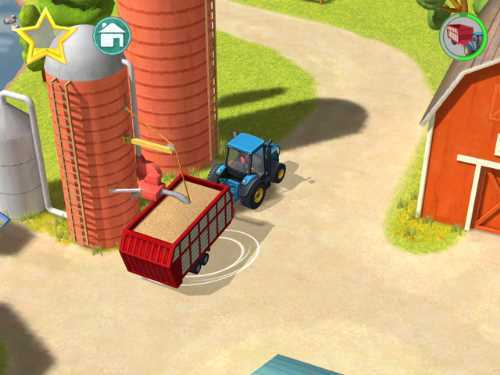 As virtual farmers, they drive a water truck, a front-loader, and a fork-lift. 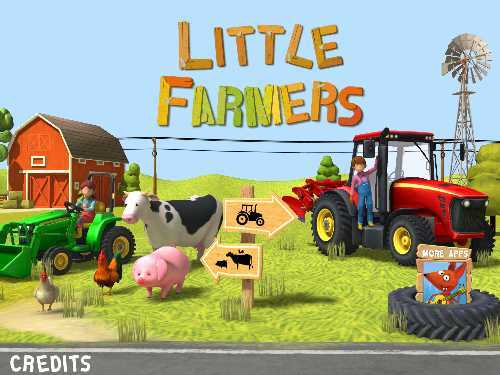 Little Farmers is a great way to introduce kids to what it is like to work on a farm. The 3D machinery is fascinating to see in action, and players can zoom in to get a closer look. They can learn about what each vehicle is used for by completing the suggested tasks and earning stickers for doing so. But the app also provides kids with the freedom to drive around to explore the farms in a somewhat limited manner. Occasionally, we drove our tractors into spots that took many attempts at backing up before we could get free. The app has a sense of whimsy that shows up in the animations. Players find these hidden hotspots by tapping on things in the scenes. For example, tapping on the boy fishing in the pond, results in his dropping his pole into the pond and then falling in after it. Also fun is zooming in on the fox who is lurking near the chicken coop, and tapping on a cow near the clothes line to see it eat a T-shirt! Little Farmers has no voiceover, so kids don't hear the name of machines. The app developers might want to add a glossary of machines so that parents can help their kids learn about each of the machines showcased in the app. A welcome feature is the diversity in the characters presented in the farm scenes. 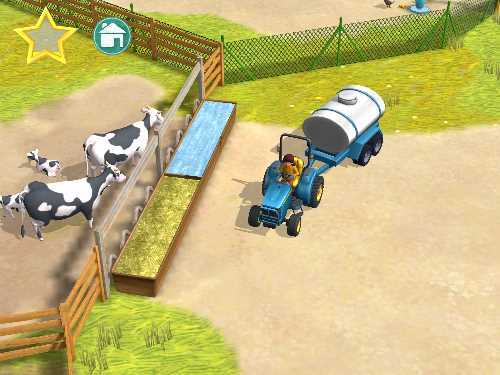 Little Farmers is a great app for taking your kids on a field trip to a working farm. It shows both female and male tractor drivers, so that all kids can enjoy the heavy lifting that these tractors perform. The focus of this app is letting kids drive tractors and other heavy machinery. 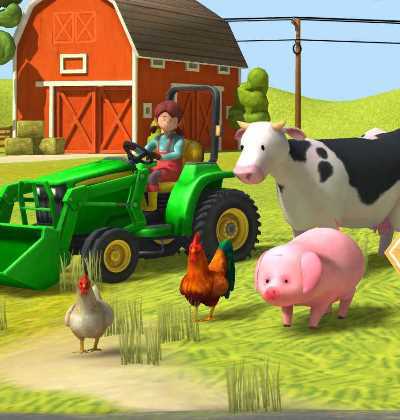 This Little Farmers app review was written by Jinny Gudmundsen.